"We will continue to harm Egypt", declares Ansar Bayt al-Maqdis terror group. The Al-Qaeda inspired Ansar Bayt al-Maqdis terror group on Sunday night claimed responsibility for the terror attack on a bus carrying Korean tourists in Taba. Army Radio quoted a Twitter statement by the group which said, “We will continue to hurt the leaders in Egypt, the economy, the tourism and the gas." The Sinai-based Ansar Bayt al-Maqdis has already claimed a series of terrorist attacks in Egypt, including the assassination of a top Egyptian police general, who was gunned down as he left his home in a west Cairo neighborhood. The group had previously claimed a car bombing which killed five people outside Cairo police headquarters last month. The group has in the past also claimed rocket attacks on the Israeli resort city of Eilat. 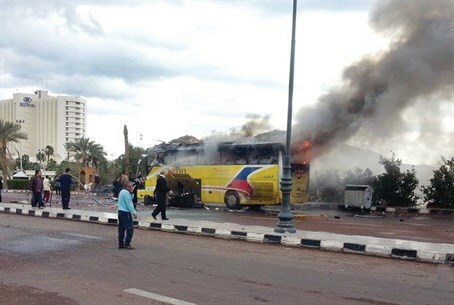 Meanwhile, Egypt’s president condemned Sunday’s attack, in which three tourists and an Egyptian driver were killed. The Egyptian presidency called the attack a “despicable act of cowardice” and vowed to bring the culprits to justice, according to The Associated Press (AP). South Korea also voiced shock and outrage over the bombing and issued a travel ban for the Sinai region, reported AFP. "We are shocked and enraged at the terrorist bombing on the bus... and strongly condemn the act," Seoul's foreign ministry said in a statement quoted by the news agency. The tourists were all members of the same church group from the central South Korean county of Jincheon who were on a 12-day trip through Turkey, Egypt and Israel. "We believe that terrorism can never be justified under any circumstances and such inhumane and unethical acts should be weeded out by all means," the ministry said. Seoul issued a total travel ban on the Sinai region and the Gulf of Aqaba, while urging its nationals living elsewhere in Egypt to take extra precautions or leave to a third country if possible, according to AFP. The attack came as former Egyptian president Mohammed Morsi stood trial in Cairo for the third time since he was toppled, this time on terror and spying charges. Egypt’s interim government says there is a direct link between Morsi’s Muslim Brotherhood and Ansar Bayt al-Maqdis, and on this basis blacklisted the Brotherhood as a terror organization. The Brotherhood has denied any link to terrorism.